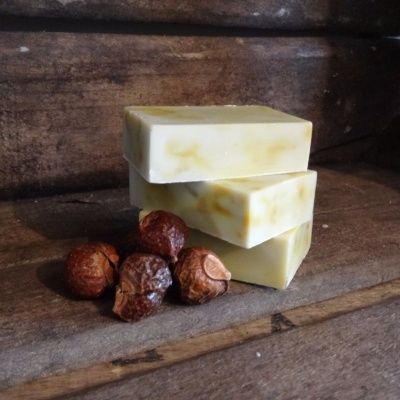 A natural, vegan soap. Gently cleansing. for sensitive skin. Can also be used as a soap/shampoo for babies or for fine hair, and as a shaving soap. Healing & Soothing. This soap has gentle cleaning amazingness. For this variety of castile soap, along with the extremely pure olive oil there is also lots of chamomile and calendula oil. NGREDIENTS: Olea Europaea (olive) fruit oil, Organic Sapindus Mukorossi (soapnut) fruit extract, Sodium hydroxide*, Anthemis Nobilis (chamomile) flower oil, Organic Calendula Officinalis (calendula) flower extract and petals. *After the saponification process, no sodium hydroxide remains.